The battery is behaving for the time being! I have photos! Of things! Here! 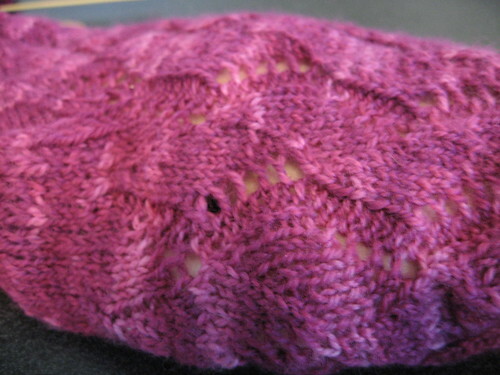 The Waving Lace socks from the Interweave sock book (25 Sensational Socks?). 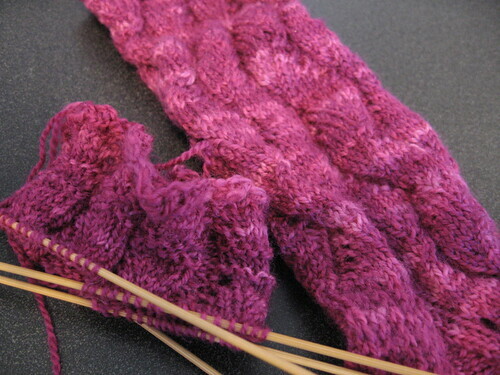 The one on the needles is the second one, and lots more stretchy at the first. I learned my lesson and cast on over more than one needle the second time around. The yarn is Fearless Fibers in Magenta (I believe). It’s awesomely soft, and really brilliantly magenta. Waving Lace with Dunny (they’re these little vinyl figurines I collect. This one’s my favorite). Detail of the pattern. The color is much more vibrant than this, but I’m in the office. The Warlock socks that I’m knitting in tandem with the ChickenGoddess. The pattern is actually Garter Rib, but the colorway is Warlock (by Twisted Fiber Arts) and I like that name better. So does the Dunny. And finally, the Rivendell socks, in Fearless Fibers Marrakesh superwash merino. I am sort of just okay with this. I’m proud of my progress, but they’re a little tight, and it’s often hard to see the pattern through all the beautiful color. 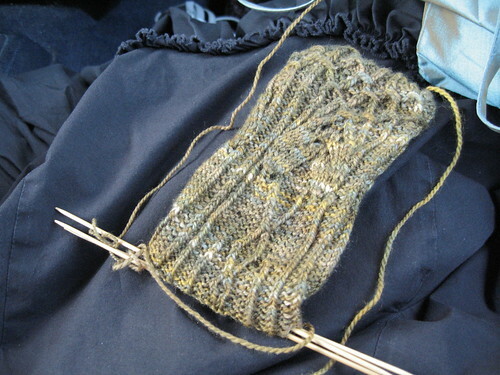 I am thinking of frogging them and doing them again in something a little heavier and less variegated (and I’m really quite fine with knitting them again – this pattern is awesome so far). And that’s pretty much what I’ve been working on. I’ve got a secret project I’ll post later, and a sweater that’s kind of on hold for the moment. 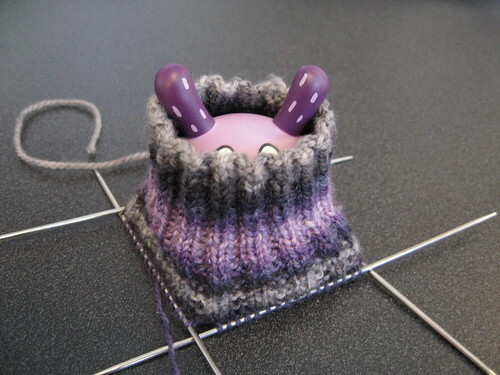 The secret project has been taking up all of my knitting time lately, but it’s going fast. It’ll all make sense later, when I can talk about it. 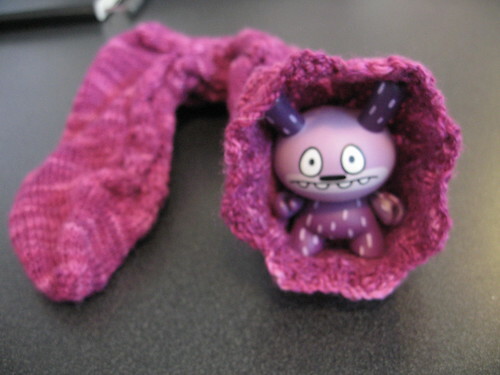 This entry was posted in General stuff, knitting and tagged knitting, photo time, socks. Bookmark the permalink.